Mohammed Siraj made headlines when the Sunrisers Hyderabad (SRH) bought him for a sum of Rs 2.6 crores before the start of IPL 2017. While he did not have ample domestic experience behind him, what caught the eye of scouts was his ability to hit the deck hard and his relentless accuracy. 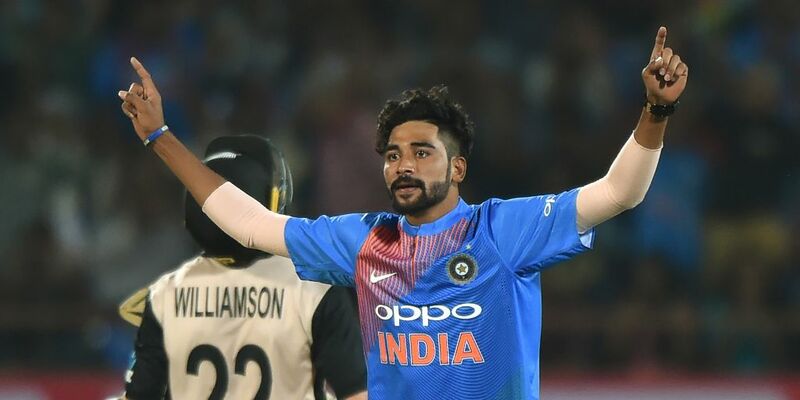 On Saturday, as the 23-year-old warms up for his debut in the second encounter between India and New Zealand in Rajkot we take a look at how lanky pacer from Hyderabad rose to prominence and earned a spot for himself in colored clothing. Son of an auto rickshaw driver in Hyderabad city, Mohammed Siraj’s story is yet another example of rag to riches tale. Initially, beginning his career as a batsman who could bowl a bit, Siraj grew up playing tennis ball cricket and was primarily self-taught. His father put in a lot of hard work to sustain the expenses of his son and ensured he went on to play domestic cricket. While his initial performances in the Ranji Trophy did not gather much notice, an impressive performance in the 2016/17 Ranji Trophy catapulted him to prominence. From thereon Siraj regularly played for the Hyderabad U22 side, Mushtaq Ali tournament and the Vijay Hazare Trophy. But what changed his fortunes was the 2016/17 Ranji Trophy season where he ended up as the joint-third highest wicket-taker and was subsequently picked up by SRH in the IPL auctions of 2017. In the IPL 2017, Siraj played six matches and picked up ten wickets with best figures of 4/32. Enjoying a healthy average of 21.2, Siraj picked up wickets at a strike rate of 13.8. His performances drew praise from the likes of VVS Laxman and David Warner as he later went to earn a spot in the India A side. With the ball, Siraj is well known for his crafty skills. A deceptive slower ball and a potent inswinger are his weapons. In an interview, Siraj had said that he was expecting a call from the national side and has deservedly earned a spot in the second T20I. Whether he lives up to expectations is a matter of conjecture and only time will have an answer to this question.